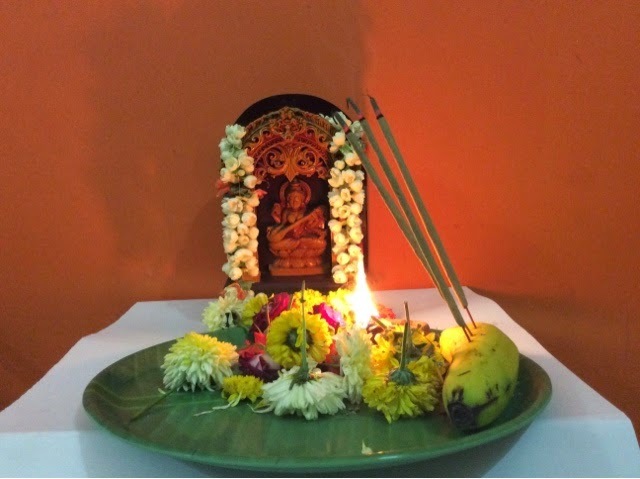 Saraswati puja has been one of my favourite festivals since my childhood. When i was a kid,I remember how my dad used to chant the mantras and we would wait patiently repeating the Sanskrit verses. Since class IX I have had the same Saraswati. Somehow I felt she should be a part of our household. So she is still there, more than twelve years now. We are supposed to immerse them every year. But yeah, she is special. On the whole I always loved the way the simple rituals were followed, along with the good food that we always had for the purpose. Even today I got fruits, sweets and incense sticks to do things as my dad used to do back in the day. Maybe when I do back, I will be able to redo everything the way we used to in the past. With all the family members present. I have almost forgotten how that feels like by now.